This article first appeared in the June, 1900 issue of The Century Magazine. 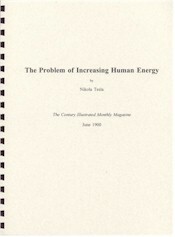 It contains a comprehensive description of Tesla's vision regarding the future of human technology. Included is an extensive review, in his own words, of the results that were obtained up to and including the time spent working at the Experimental Station in Colorado. As a significant part of the Tesla canon, this piece is highly recommended. Click here for the online text-only version. THE ONWARD MOVEMENT OF MAN�THE ENERGY OF THE MOVEMENT�THE THREE WAYS OF INCREASING HUMAN ENERGY. Though we may never be able to comprehend human life, we know certainly that it is a movement, of whatever nature it be. The existence of movement unavoidably implies a body which is being moved and a force which is moving it. Hence, wherever there is life, there is a mass moved by a force. All mass possesses inertia, all force tends to persist. Owing to this universal property and condition, a body, be it at rest or in motion, tends to remain in the same state, and a force, manifesting itself anywhere and through whatever cause, produces an equivalent opposing force, and as an absolute necessity of this it follows that every movement in nature must be rhythmical. Long ago this simple truth was clearly pointed out by Herbert Spencer, who arrived at it through a somewhat different process of reasoning. It is borne out in everything we perceive�in the movement of a planet, in the surging and ebbing of the tide, in the reverberations of the air, the swinging of a pendulum, the oscillations of an electric current, and in the infinitely varied phenomena of organic life. Does not the whole of human life attest to it? Birth, growth, old age, and death of an individual, family, race, or nation, what is it all but a rhythm? All life-manifestation, then, even in its most intricate form, as exemplified in man, however involved and inscrutable, is only a movement, to which the same general laws of movement which govern throughout the physical universe must be applicable.